Attractive red design on this wool/cotton HuB sweater. 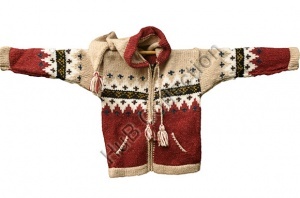 This handcrafted sweater has a pixie hood (with tassels), and a full length zip. Striking design with two edged pockets at the front. Size 6 for 6/7 years of age. Free PxP for delivery to UK, NI and Channel Isles.